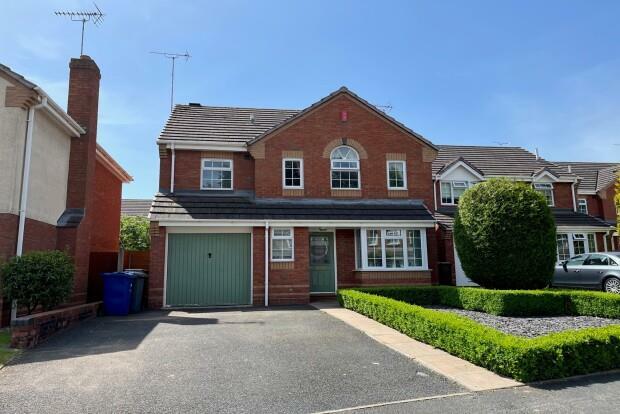 4 Bedroom House To Rent in Uttoxeter for £925 per Calendar Month. Entrance to hall with under-stairs storage, access to garage, guest w/c, sitting room, kitchen and dining room. The dining room has a bay window to front, sitting room is to the rear of the property and has French doors opening to the patio area of the garden plus gas fire with surround. The kitchen is fitted with wall and base units, has a breakfast bar, stainless steel gas range cooker with matching hood above and tiled floor. To the first floor are the 3 double bedrooms plus a single bedroom and bathroom. The master bedroom has an en-suite shower room and built in wardrobes. The bathroom has a white three piece suite. Externally, to the rear is a summer house, shed and decked area. To the front is a small garden with slate and small trimmed hedges. N.B. The garage will not fit a car in as it has a wall dividing the utility area to the front storage area.